Aga Khan Hosts Singapore Minister in Paris - 2009-01-18 | Ismaili.NET - Heritage F.I.E.L.D. Singapore Foreign Affairs Minister George Yeo was hosted to lunch by the Aga Khan. During the lunch, the Aga Khan announced he would establish an Ismaili Centre and regional representative office of the Aga Khan Development Network (AKDN) in Singapore. I was hosted to lunch at the Aga Khan's residence on the Isle de la Cite in the River Seine. It is a charming old property located on the same island as the Notre Dame Cathedral. Our conversation followed on our last meeting in Singapore last December. The Aga Khan has since decided to establish an Ismaili base in Singapore for his Foundation's work. I welcomed it and promised to facilitate its materialisation. There are a number of areas where Singapore and the Aga Khan Foundation can work together to develop capacity in developing countries. 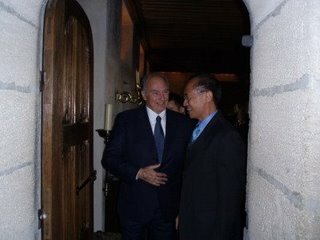 Minister for Foreign Affairs George Yeo was hosted to lunch by His Highness the Aga Khan at the latter's residence in Paris on 18 January 2009. It was a follow-up to their earlier meeting in December 2008 when the Aga Khan visited Singapore as part of his Golden Jubilee celebrations. SINGAPORE : Singapore Foreign Affairs Minister George Yeo is in Paris for a three-day official visit. On Sunday, he was hosted to lunch by the Aga Khan, who is the Imam of Shi'a Ismaili Muslims. According to a statement from the Foreign Affairs Ministry, the lunch was a follow-up to their earlier meeting last December, when the Aga Khan visited Singapore as part of his Golden Jubilee celebrations. During the lunch, the Aga Khan announced he would establish an Ismaili Centre and regional representative office of the Aga Khan Development Network (AKDN) in Singapore.